In the spirit of the political season, here’s a few ads that have arrived here in my mailbox in Cincinnati. Thought I’d take a look and see what they can tell us about this year’s elections. Without further ado, let’s start with Erik Nebergall. The first thing you notice is that Erik’s picture is in color and his opponent’s is in black and white. I wondered if this was on purpose so I did a quick Google search to see if I could find the original picture. 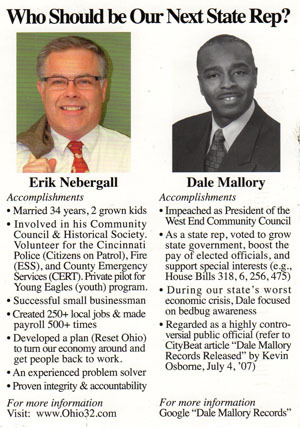 Sure enough, this picture is from Dale Mallory’s State Representative 32nd District web page. And it’s in color. Notice that Dale looks a lot better in color. Probably why the Nebergall campaign team changed the photo to B&W. The next thing I noticed is that Mr. Nebergall lists as his top accomplishment: “Married 34 years, 2 grown kids”. That’s great. But what does it have to do with politics? If I listed this on a job resume, would this help my case? Erik then lists his big argument: that Dale Mallory was impeached as President of the West End Community Council. He suggests doing a Google search on “Dale Mallory Records”. Here’s what the Interwebs revealed. Apparently, Mallory was impeached as President of the West End Community Council. And he ran into some accusations of having cashed a check that emptied the Council’s bank account. However, very little, if anything seems to have been proven. Yet nonetheless, none of this looks good for Mallory. None of this, however, stopped Mallory from winning the State Representative position for the 32nd in 2008. Edge: Based solely on this advertisement, I’d give the edge to Dale because a) I don’t like it when a politician’s only argument is negative and b) if you have to list marriage as one of your accomplishments, you probably don’t have enough qualifications. Next up. 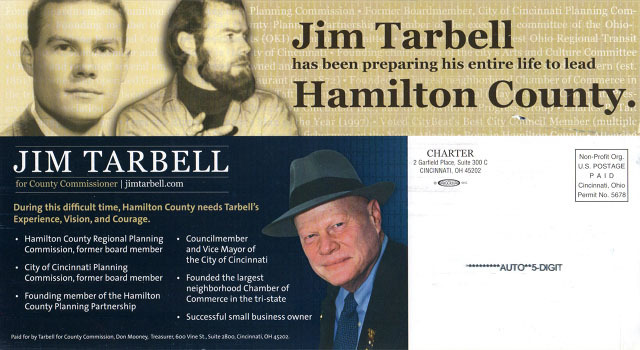 Jim Tarbell vs. Chris Monzel for County Commissioner of Hamilton County. I give Tarbell credit for not going negative in his ad. Not only is there nothing negative about his opponent, Tarbell doesn’t even mention him. What I couldn’t figure out at first was: Who is the guy in the beard next to a younger Tarbell? Then I realized that this was Tarbell, too. But it’s hippie Tarbell. Maybe not the best picture of Jim to use. What’s missing most from Tarbell’s advertisement is what he would do or what he stands for. His ad makes a case based solely on his experience. Not necessarily a bad thing, but I don’t know where Tarbell stands. 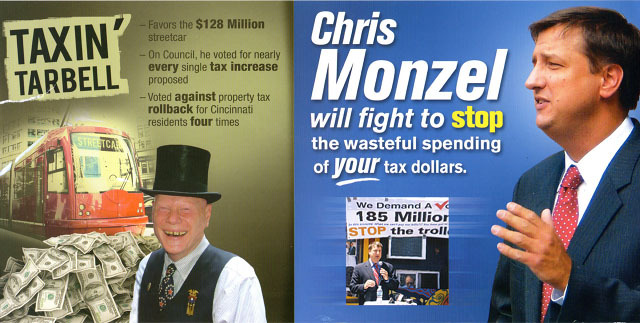 By contrast, Chris Monzel uses his opposing ad to show you where he stands and to try to define his opponent. Monzel claims he’s for stopping wasteful spending and calls his opponent “Taxin’ Tarbell”. Someone got a little creative and used the picture of Tarbell to paint him as the Monopoly character Rich Uncle Pennybags. This was an interesting way of using Tarbell’s trademark top hat image against him. Monzel also makes sure to mention that Tarbell is for the Cincinnati streetcar – an issue which conservatives in town have used as a symbol for wasteful spending. Edge: Based solely on these two advertisements, I’d give the edge to Monzel. Even though his ad is negative (which I’m not fond of), he does a better job of defining what he stands for and simultaneously what he feels his opponent stands for. My apologies, Joan. I used an ad that came rather recently so I thought it was the most up-to-date. I’ll send you my address and post the updated ad when I receive it. Appreciate the comments and good luck in the upcoming election! p.s. I happened to see Jim play the national anthem when Bill Clinton came to town and have to say I’m a fan.